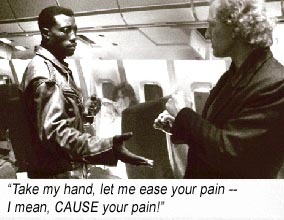 Wesley Snipes is airline security specialist Cutter, who is the titular PASSENGER 57 onboard a flight when it is hijacked by British terrorists trying to escape the FBI (Bruce Payne as Charles Rane (who falls mainly on the plane), and a strikingly beautiful Elizabeth Hurley as his Bad Girl). Wesley must use his patented Wesley-Kwon-Do to bring down the bad guys and the plane efficiently. Too easy to say “DIE HARD on a plane” – because it is. The only baggage Cutter has brought is flashbacks to when his wife was killed by a convenience store terrorist and he failed to stop it. Luckily, a black stewardess who looks like his wife (Alex Datcher) is serving plot device cocktails, so he can hook up with her after he shows off his smack talk and Wesley-fu. Cutter: Do you play roulette? Cutter: Always bet on black! Cutter takes out the bad guys as reliably as “Come here often?” has been used as an unsuccessful icebreaker for centuries. Plane lands in hick town near a county fair; hick Sheriff chases Cutter cos he thinks he’s the bad guy (remember in those hick towns, all it takes is to be black and nearby); people running and screaming as bad guys invade county fair (ah yes, director Kevin Hooks leans on the old gambit of “confusion” for “action”), and the plane hostages go free so that plane can go up in Big Orange Explosion with – you guessed it – a vehicle transporting massive amounts of fuel that apparently has no failsafe measures not to explode if impacted; to wake audiences from the drowse they’ve fallen into by watching this movie. In the climactic fight scene between Cutter and Rane, turns out Rane knows some Wesley-Fu himself, so battle is exciting enough for us to wonder who is going to win. No, not really. Go back to sleep. Writers: Stewary Raffill, Dan Gordon, David Loughery. Starring: Wesley Snipes, Bruce Payne, Tom Sizemore, Alex Datcher, Bruce Greenwood, Robert Hooks, Elizabeth Hurley, Michael Horse, Marc Macaulay, Ernie Lively.